Our interests as an company are to provide a innovative service to an industry where customer satisfaction is fundamental. 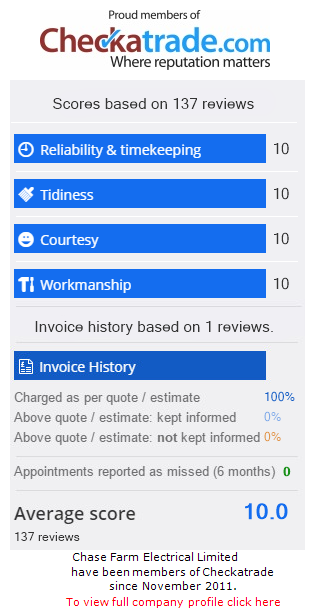 We pride ourselves on the ability to provide complete customer service and satisfaction by achieving an excellent working relationship with our customers, identifying and discussing your exact requirements, providing a clear concise quotation and carrying out work to the highest standards with minimal disruption. With many years experience, we are fully qualified to carry out a wide range of electrical services with the backing and support of the NICEIC professional body. All work undertaken comes with an NICEIC warranty and comprehensive certificates. Customer in Fareham, Replace consumer unit and electrical installation report. Customer in Southampton, Fault finding and fitting rebuild. Customer in Southampton, Rectification of electrical faults on house purchase survey. Customer in Alresford, Wiring of a garden summerhouse.